From the Wall Street Journal, bestselling author of Everything We Keep comes the highly anticipated sequel. 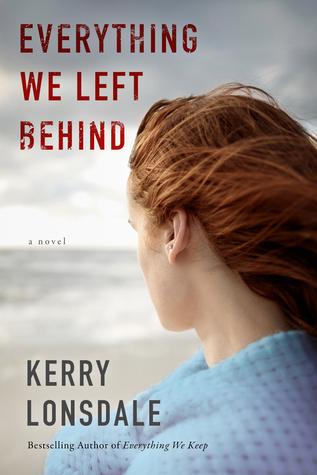 Told from one man’s two perspectives, Everything We Left Behind effortlessly blends suspense, mystery, and romance in an exploration of loss, resilience, and the compelling need to protect the ones we love at all cost. Two months before his wedding, financial executive James Donato chased his trade-laundering brother Phil to Mexico, only to be lost at sea and presumed dead. Six and a half years later, he emerges from a dissociative fugue state to find he’s been living in Oaxaca as artist Carlos Dominguez, widower, and father of two sons, with his sister-in-law Natalya Hayes, a retired professional surfer, helping to keep his life afloat. But his fiancée, Aimee Tierney, the love of his life, has moved on. She’s married and has a child of her own. Everything We Left Behind is the heart wrenching 2nd book in the Everything We Keep series. This book focuses on James/Carlos and his recovery from the dissociative fugue state (click here for a full explanation)that he had been in for 6 1/2 years. The reader is taken on a journey from Mexico to California to Hawaii as James struggles to come to term with what happened to him and trying to remember exactly what happened on that boat, 6 1/2 years ago. My heart broke for James. I couldn’t even imagine waking up one day and having no memories of the past 6 1/2 years. No memories of Marcus’s birth or Julian’s adoption. No memories of his dead wife and no memories of Natalya. The only memories that he had were of Aimee and that was 6 years earlier. Thankfully, Carlos (James’s other identity while he was in the fugue) kept a diary and wrote everything down for 6 years. So when James started reading that diary, he was filled in on everything but still, it was a shock. As much as Aimee annoyed me in Everything We Keep, I couldn’t help but feel bad for her. She resolved her feelings for James after finding him in Mexico while in the fugue. Then he comes back, 6 1/2 years later, with no memories and still madly in love with her. The scene where she shows up at James’s childhood home made me cry and then the scene at the graveyard where she showed James his headstone and told him that they could never be friends, that she was happily married with a child….again made me cry. Normally, I hate it when the author chooses to go back and forth in time in a book. It drives me nuts because I can never follow along. But, in Everything We Left Behind, the author chose to change from 3rd person to 1st person….on top of heading the chapter with Carlos–three years ago or James—-present day. I was never confused about who I was reading about or what time period. Which was wonderful. The whole Phil and Thomas storylines were also heartbreaking (a word I am using a lot in this book). Thomas is doing everything in his power to keep James safe and Phil, well let’s just say that what I thought about him totally changed at the end of the book and I looked at him in a different light. The romance between Natalya and Carlos was breathtaking and all-consuming. I could understand where she was coming from when she kept turning him down every time he asked her to marry him. When/if he came out of the fugue, he wouldn’t know who she was. Even though they were completely in love with each other, she kept him at arm’s length. So when James and the boys came to stay with her, after finding out that Phil was out of jail, I could totally get how hard it was for her. How her heart was breaking and it was hurting to be near him. Totally get it. I will say that the end of the book was pretty interesting. Mainly the part about how James came out of his fugue. Again, while some of the storylines were wrapped up, a few weren’t. I am hoping for book 3!! Why: Great storyline with great characters.